Manny 'Pacman' Pacquiao is a transcendental fighter, a champion of eight weight classes yet under appreciated and underrated by many. He is regarded as the modern day Henry Armstrong and although Armstrong is one of the greatest boxers of all time, he 'only' ruled 3 different weight classes, fought on 4 as compared to Manny's lineal eight. Henry was a featherweight, lightweight and welterweight champion while Pacquiao barely was a flyweight when he started boxing as he secretly put weights on his pocket to qualify and legally box but fought up to light middleweight. Pacquiao is the last one of a dying breed, a throwback fighter who never ducked anyone. Even at age forty, he is willing to fight the young lions of welterweight yet a lot of people discredit him for his achievements. Let's put things in perspective here, this is a naturally small guy who fights bigger guys. What Pacquiao has done is unreal. Some boxers who attempted moving up in weight got crushed even if the bigger fighter they fought against is not an elite fighter. It just is. The power that bigger guys possess is not the same as the ones on the lower weight class. Manny proved it time and time again that not only he can dish it out, he can also take the punches of bigger guys some 30 lbs heavier than him come fight night. Over the course of his decorated career, Pacquiao has defeated 21 world champions - Chatchai Sasakul, Lehlohonolo Ledwaba, Jorge Eliecer Julio, Marco Antonio Barrera (twice), Erik Morales (twice), Oscar Larios, Jorge Solis, Juan Manuel Marquez (twice), David Diaz, Oscar De La Hoya, Ricky Hatton, Miguel Cotto, Joshua Clottey, Antonio Margarito, Shane Mosley, Brandon Rios, Timothy Bradley (twice), Chris Algieri, Jessie Vargas, Lucas Matthysse and recently Adrien Broner. Manny is a freak of nature. How can a small guy start from barely a flyweight, move up to light middleweight and settle to welterweight and still dominate like he does? All time greats historically can only move up 3 or 4 weight classes and even that is a rarity. Jorge Linares, Amir Khan to name a few of recent memory attempted to move up in weight and you know what happened to them. Now Mikey Garcia is attempting to do the same and a lot of people are afraid of his well-being as he fights the formidable Errol Spence. When Pacquiao fought bigger guys, they say they are tailor-made for him. They are slow, washed up, too old. For Cripe's sakes, Manny is forty years old and still fights like an elite 30 year old. Give the man his credit. When he fought the young Broner who is considered fast, Adrian looked very slow compared to Manny yet Broner 'just didn't have enough output'. There are always excuses for Pacquiao's opponents and criticism instead of giving credit to Manny's greatness. He fought Margarito and was on the receiving end of Antonio's power shots yet Pacman took the shots, annihilated the bigger man and reconfigured his face. Joshua Clottey clamped on like a shell when he fought Pacquiao. Hall of famers Oscar Dela Hoya, Shane Mosley barely did anything when they fought him. These great champions all of a sudden become tentative and ordinary fighters when they fought Pacquiao because they get overwhelmed by him. Most of them fight to survive and not to win once they get a taste of Pacquiao's pesky speed and power. For those who decided to go toe to toe with him like Cotto, Barrera, Morales, Diaz, Hatton, they all got busted up and paid a hefty price. With the exception of Morales on their first fight and Marquez on all their duels, no one else got close to inflicting and receiving similar punishments to each other. Even with Marquez scoring an emphatic knockout on Pacquiao on their last and final fight, Marquez was retreating and reeling from the blows he was receiving until that Pacquiao's mistake and got caught with a clean right straight. Marquez by the way has suspicion of steroid use on that fight. Heck even Floyd Mayweather who self-proclaims TBE, although he won the match did not really dominate Pacquiao and that is a testament to Pacquiao's ability. Still Manny gets discredited. Let's reverse this. Manny realistically can still make it to 140 and even 135 if he wants to. Just imagine if 'High Tech' Lomachenko receives that blow from Pacquiao. With that speed and power, Vasiliy will get hurt, really hurt. Now let's shrink Mayweather to 140 and get him to fight Pacquiao, who wins? Exactly! It is mind blowing that Manny is still underrated by many. 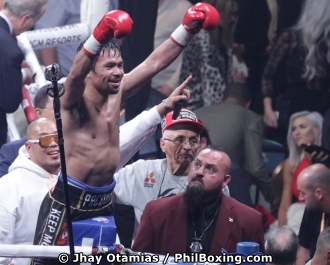 Moving up in weight and performing at a very high level is one thing but the main quality of Pacquiao that is never mentioned is his work ethic and his passion for the game. He has the warrior mentality, heart and resiliency. Wins and Losses do not define legacy. Mayweather is obsessed with the zero on his win-loss column yet the ones considered as greatest fighters of all time have losses in their careers. Manny coming back from defeat and rising like a phoenix after a devastating loss from Marquez, from questionable losses to Bradley and Horn, and other early defeats is remarkable. He has that ultra-rare mental toughness. Lots of undefeated fighters were never the same when they tasted their first loss. Even Roach admit he was not the same fighter when he got his first loss. But Manny's resiliency is unprecedented. And imagine doing this while he has a full time job as a Senator while all the opponents only does one thing, boxing. And by the way, the guy is forty years old which is a feat in itself as he still displays high level boxing even with what many considers as advanced age in boxing. It is truly remarkable on all facets of Pacquiao's career and he is still underrated and under appreciated. Consider yourself lucky and give the man credit and enjoy his legacy that we are witnesses of. Pacquiao's legacy and greatness will live on whether you like it or not. History proves that. Click here to view a list of other articles written by Estace Yambot.